Computers, art, and science; as daily as possible. "Game Mod was a six hour long workshop with the objective of showing the participants that it is not required to understand code to experiment and play with it." See the video (Quicktime). Beth and I just got back from vacation in San Francisco on Sunday. See the photo set on Flickr. 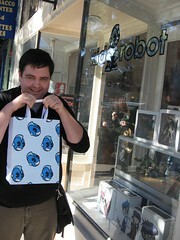 A giant Japanese robot escapes the studio to shoplift and beat up children. Awful music, great idea. eskimoblood has released a nice Processing library for 3D surface rendering. The possibilities are illustrated in this Flickr photoset, and in this video in which a surface pulses and deforms in time with music. Paul Bourke's site has a large gallery of surfaces and details on the equations that describe them. My friend Colin recently introduced me to the Prelinger Archives, a collection of educational and special interest films produced between 1927 to 1987. The "Most Downloaded Items" box on the right is a good place to start. Sure enough, Duck and Cover is by far the most viewed item. 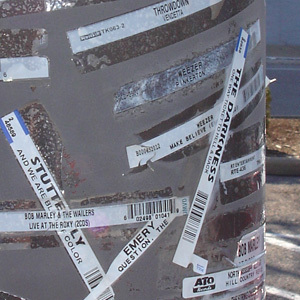 A lamppost covered in about 150 CD packaging stickers, outside the Best Buy location in Fairview Heights, Illinois. A wide variety of musical genres and time periods were present, and no other post in the lot had a CD sticker. "Stigmergy is a method of communication in emergent systems in which the individual parts of the system communicate with one another by modifying their local environment. [...] 'Stimulation of workers by the performance they have achieved.'" I remember a ride at Six Flags when I was a kid that started with a boat going into a cave. Where the ceiling dropped into reach, there was a huge neon splotch where countless bits of chewing gum had been stuck together. One solid plate of gum, beginning with a single piece and accelerating outward. Generator.x has a sneak preview of SodaPlay 2.0. PlayForge, the new construction and simulation environment, will include a public API allowing users the add and share new features. VisualComplexity.com lists 172 projects in complex data visualization, with images and summaries. Two of the best software synthesizers ever, ReBirth and RubberDuck, are now completely free. I tortured many a roommate with my awful ReBirth tracks in the 90's. I called the effort Brain Fusion, then Kodama, then Kid Icarus (whoops, already taken), then Kodama again. As I remember it, more kids were messing with cracked copies of ReBirth in high school than were trying to play guitar. I'm back from another summertime lapse in posting. Life has been pretty good, and very busy over the last two months. In July, I began a new job developing software for the government. My coworkers are great, and I'm learning a lot of new technologies and design practices. The future looks promising. Otherwise, I've been juicing the last weeks of summer with as bohemian a life as I can. I'm biking almost every day, logging about twelve miles a trip. Reading is fun again too; I strongly suggest Monkey King: Journey to the West.